Killarney, Ireland is one of the most picturesque towns in country's beautiful South-West. For that reason, it is on the list of "things to do" for many visitors. It is a dreamy Irish town which means that it appeals to many of the larger touring groups, so it is also very busy. But does that mean that you should skip Killarney? No - even though the town can be a bit touristy and even crowded, it is certainly worth visiting, though it is best to plan your trip to Killarney outside the main season. Nestling between high hills and large lakes, Killarney is located in the southern part of County Kerry. The landscape is nothing short of spectacular and comes with a stunning and scenic drive to the town. Though be warned that this is an area of Ireland where you should heed all tips for driving and be alert at all times. National roads leading to Killarney are the N22, the N71, or the N72, though the town may also be reached by train from Cork and Dublin. Killarney is the perfect starting point for exploring some of the Republic of Ireland's most beautiful natural attractions, such as the Ring of Kerry, Kerry Way walking trail and Killarney National Park. In addition to having gorgeous outdoor spaces, Killarney is a sweet town full of cozy pubs and stores selling local handicrafts. Just over 14,000 people live in Killarney, with another thousand or so in the rural fringes of the town proper. Due to a massive number of hotel beds, the perceived seasonal fluctuations in populations are enormous. The area was already settled for ages when a Franciscan monastery (built in 1448) and nearby castles elevated it to a local center. Some mining provided industrial employment, but the tourism industry started off here as early as 1700. Travel writers and the opening of the railway boosted Killarney's influx of visitors even more in the 19th century, and even Queen Victoria made a visit here - and her royal influence helped make the town a major Irish vacation destination. Her Ladies-in-Waiting also established one of the most spectacular viewpoints, named "Ladies' View" even today. Killarney remains one of the top tourist destinations for both Irish and foreign visitors. Tourism is very important to the town and many of the local businesses are set up to take care of visitors. Though there are some factories outside of town, the hospitality sector and smaller shops dominate the town center. Opinions about Killarney differ - it is geared towards tourism and not much else. This can make it the perfect vacation spot for some, or make it feel like a tourist-trap-nightmare for others. Beauty, as ever, lies in the eye of the beholder. The numerous hotels are necessary to cope with the influx of visitors and make the town itself seem insignificant at times. Yet Killarney has its quiet, unspoiled corners, especially in the National Park. Whenever you go, Killarney is bound to be busy. It might be best to avoid the town during July and August and any Irish bank holidays. Take note that Killarney can lay claim to having some of the highest prices for overnight stays in the main season. Killarney, Ireland is so popular because of its location but also because the town itself is so stereotypically Irish. Plan to walk through downtown to see the storefronts or stop for a meal of fish and chips. There are not, however, many major sites to see inside Killarney itself. Nearby Muckross House and Muckross Farm are popular all year round, the typical horse-drawn "jaunting cars" will take you there. 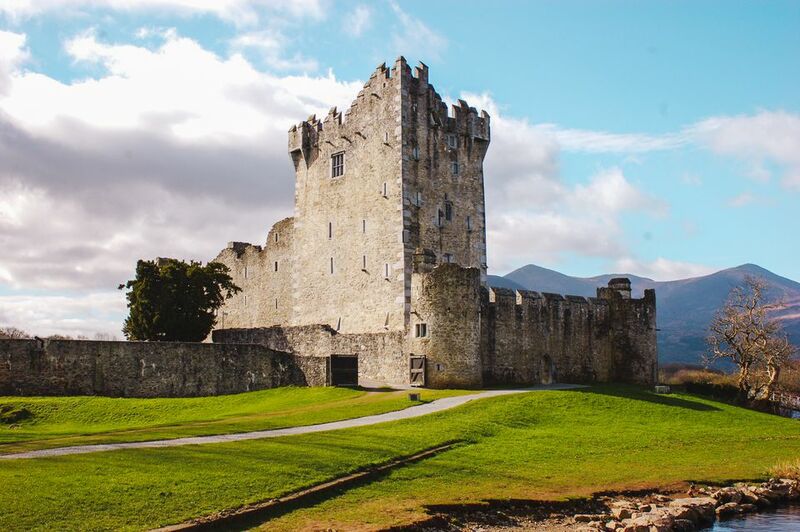 Or head for Ross Castle (built around 1420) and from there take a boat trip on the lakes of Killarney, either a tour of the lakes or a round trip to Inisfallen. On the other side of Tomies Mountain (2,411 ft) and Purple Mountain (2,730 ft) a (careful!) drive, ride or hike through the Gap of Dunloe is a dramatic experience. Coming from Killarney in a car you might be interested in pressing on towards Moll's Gap, a dramatic mountain pass slightly spoiled by the modern souvenir shop on top. But the views are magnificent and the N71 will take you back via Ladies' View and through several interesting curves and tunnels to Killarney. Hidden in the woods is the sixty feet high Torc Waterfall, another must-see. Stop in Killarney as a place to re-energize before setting out to drive the Ring of Kerry, one of Ireland's most famous road trip routes.